This film was in sore need of a strong stylized narrative. I attribute this to the director, Soderbergh, who is known for being heavy handed and muddy in his story telling. The storytelling was laborious and at times disjointed. Just shows you can have 4 well known and very competent actors, Douglas, Banderas, McGregor and Fassbender, who if not given a good script and proper direction will not produce a film worthy of their stature. The focus on Mallory's fighting skills (Carano is an ex MMA fighter) is one of this film's downfalls. Instead of having her take out someone with a sniper rifle and suppressor she *has* to engage in minutes of hand to hand combat and literally beat them into submission or abeyance. I do give Carano credit for taking on such a prominent acting role (she clearly needs to still grow as an actor), but since she didn't have the acting chops equal to her co-stars she should have been molded into a more minimalistic character focused tightly on her skill as a badass assassin/super agent. There's been a lot of talk comparing this film to the Bourne franchise. What Bourne had and this movie lacks is a fast paced intricate yet clearly articulated plot where all of the story arcs and even sub plots are integrated and contribute to a single intelligent narrative. I've never seen a Soderbergh movie before. At this point in time, none of his movies sound/look interesting enough for me to sit down and watch. 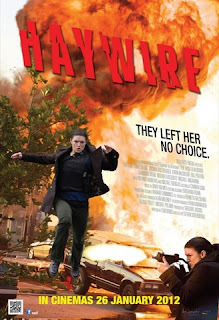 I'm think since there is no word of "Haywire 2: They Left Her No Choice Again", I assume it is nowhere as good as "Bourne Identity". Heh. It's definitely not as good. They could have done so much more with the abundant acting talent, pity.